TSW Performance Lowering Springs for R56 MINI Cooper and Cooper S. These are by far the best lowering springs for your MINI. They are cold wound of the highest quality chrome silicon material, shotpeened, and then powder coated black.Being black is really great if your worried about warranty, they will look stock so most dealer techs don't even notice. The front drop settling in about 1" and the rear about 3/4". Why the difference? We think the front of the R56 MINI is way to high. If you only want a slight drop to close up the wheel gap, look no further. We also only lower it this amount to maintain shock travel, this keeps the shocks from bottoming out and allowing the shocks to last longer. Linear design front and rear, slight increase in rate over stock in front and rear - they play well with OEM shocks/struts, Koni Yellows and Bilstein SP's. The ride with OEM shocks/struts is by far better than with OEM springs... The rear spring rate is slightly higher than the front spring rate - our testing on the R56 revealed the rear needed a bit more spring... It allows you, the user, to dial in whatever you want with a rear sway bar. Being that they're cold wound, they won't sag in, and the rates are more predictable... 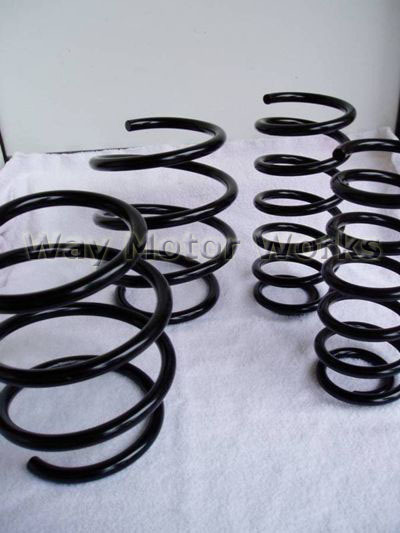 These are top quality springs! I got these installed and am very impressed. They aren't that noticeable as far as wheel gap, to me they make the car look just right, not slammed, not jacked up like stock. But where these things really shine is making the car feel planted. You have to cut the bump-stops so you're not hitting them on the bumps. These springs are excellent!